How stars are born from clouds of gas is a rich physics problem whose solution will inform our understanding of not just stars but also planets, galaxies, and the universe itself. Star formation is stupendously inefficient. Take the Milky Way. Our galaxy contains about a billion solar masses of fresh gas available to form stars-and yet it produces only one solar mass of new stars a year. Accounting for that inefficiency is one of the biggest challenges of modern astrophysics. 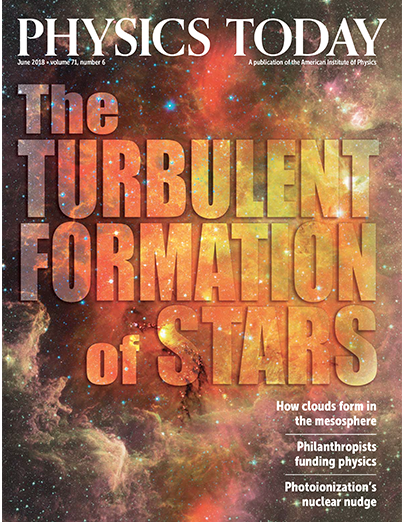 Why should we care about star formation? Because the process powers the evolution of galaxies and sets the initial conditions for planet formation and thus, ultimately, for life. Physics Today cover, June 2018.